2011-09-01 Assigned to ACUSHNET COMPANY reassignment ACUSHNET COMPANY ASSIGNMENT OF ASSIGNORS INTEREST (SEE DOCUMENT FOR DETAILS). Assignors: COMEAU, BRIAN, SULLIVAN, MICHAEL J. A golf ball includes a thermoplastic inner core layer having a geometric center hardness less than a surface hardness to define a “positive hardness gradient.” An outer core layer is disposed about the inner core, the outer core being formed from a thermoset rubber composition and having a surface hardness less than a hardness at a point about 0.5 to 2 mm from an interface between the inner core and the outer core layer to define a shallow “negative hardness gradient.” An inner cover layer is formed over the outer core layer and an outer cover layer is formed over the inner cover layer. The “positive hardness gradient” of the inner core is up to about 10 Shore C and the shallow “negative hardness gradient” of the outer core layer is less than about 10 Shore C.
This application is a continuation-in-part of co-pending U.S. patent application Ser. No. 12/337,718, filed Dec. 18, 2008, which is a continuation-in-part of U.S. patent application Ser. No. 12/335,935, filed Dec. 16, 2008 and now U.S. Pat. No. 7,762,910, which is a continuation-in-part of U.S. patent application Ser. No. 12/196,514, filed Aug. 22, 2008 and now U.S. Pat. No. 7,621,825, which is a continuation-in-part of U.S. Pat. No. 7,427,242, filed Nov. 14, 2007. This invention relates generally to golf balls with cores, more particularly cores containing a thermoplastic inner core having a surface hardness greater than the center hardness to define a “positive” hardness gradient and a rubber-based outer core layer having a surface hardness slightly less than the center hardness to define a shallow “negative” hardness gradient. Solid golf balls are typically made with a solid core encased by a cover, both of which can have multiple layers, such as a dual core having a solid center (or inner core) and an outer core layer, or a multi-layer cover having inner and outer cover layers. Generally, golf ball cores and/or centers are constructed with a thermoset rubber, such as a polybutadiene-based composition. Thermoset polymers, once formed, cannot be reprocessed because the molecular chains are covalently bonded to one another to form a three-dimensional (non-linear) crosslinked network. The physical properties of the uncrosslinked polymer (pre-cure) are dramatically different than the physical properties of the crosslinked polymer (post-cure). For the polymer chains to move, covalent bonds would need to be broken—this is only achieved via degradation of the polymer resulting in dramatic loss of physical properties. Thermoset rubbers are heated and crosslinked in a variety of processing steps to create a golf ball core having certain desirable characteristics, such as higher or lower compression or hardness, that can impact the spin rate of the ball and/or provide better “feel.” These and other characteristics can be tailored to the needs of golfers of different abilities. Due to the nature of thermoset materials and the heating/curing cycles used to form them into cores, manufacturers can achieve varying properties across the core (i.e., from the core surface to the center of the core). For example, most conventional single core golf ball cores have a ‘hard-to-soft’ hardness gradient from the surface of the core towards the center of the core. In a conventional, polybutadiene-based core, the physical properties of the molded core are highly dependent on the curing cycle (i.e., the time and temperature that the core is subjected to during molding). This time/temperature history, in turn, is inherently variable throughout the core, with the center of the core being exposed to a different time/temperature (i.e., shorter time at a different temperature) than the surface (because of the time it takes to get heat to the center of the core) allowing a property gradient to exist at points between the center and core surface. This physical property gradient is readily measured as a hardness gradient, with a typical range of 5 to 40 Shore C, and more commonly 10 to 30 Shore C, being present in virtually all golf ball cores made from about the year 1970 on. The patent literature contains a number of references that discuss ‘hard-to-soft’ hardness gradients across a thermoset golf ball core. Additionally, a number of patents disclose multilayer thermoset golf ball cores, where each core layer has a different hardness in an attempt to artificially create a hardness ‘gradient’ between core layer and core layer. Because of the melt properties of thermoplastic materials, however, the ability to achieve varied properties across a golf ball core has not been possible. Unlike thermoset materials, thermoplastic polymers can be heated and re-formed, repeatedly, with little or no change in physical properties. For example, when at least the crystalline portion of a high molecular weight polymer is softened and/or melted (allowing for flow and formability), then cooled, the initial (pre-melting) and final (post-melting) molecular weights are essentially the same. The structure of thermoplastic polymers are generally linear, or slightly branched, and there is no intermolecular crosslinking or covalent bonding, thereby lending these polymers their thermo-labile characteristics. Therefore, with a thermoplastic core, the physical properties pre-molding are effectively the same as the physical properties post-molding. Time/temperature variations have essentially no effect on the physical properties of a thermoplastic polymer. As such, there is a need for a golf ball core, in particular a dual core, that has a gradient from the surface to the center. The gradient may be either soft-to-hard (a “negative” gradient), hard-to-soft (a “positive” gradient), or, in the case of a dual core having a thermoplastic inner core layer, a combination of both gradients. A core exhibiting such characteristics would allow the golf ball designer to create a thermoplastic core golf ball with unique gradient properties allowing for differences in ball characteristics such as compression, “feel,” and spin. The present invention is directed to a golf ball having an inner core layer formed from a thermoplastic material. The inner core has a geometric center hardness that is less than the surface hardness to define a “positive hardness gradient.” An outer core layer is disposed about the inner core and is formed from a thermoset rubber composition. The outer core layer has a surface hardness that is less than the hardness measured at a point about 0.5 to 2 mm from the interface between the inner core and the outer core layer to define a shallow “negative hardness gradient.” An inner cover layer is formed over outer core layer and an outer cover layer is formed over the inner cover layer. The “positive hardness gradient” is up to about 10 Shore C and the shallow “negative hardness gradient” is less than about 10 Shore C.
The thermoplastic material used to form the inner core layer is typically an ionomer, a highly-neutralized ionomer, a thermoplastic polyurethane, a thermoplastic polyurea, a styrene block copolymer, a polyester amide, polyester ether, a polyethylene acrylic acid copolymer or terpolymer, or a polyethylene methacrylic acid copolymer or terpolymer. Preferably the inner core is formed from a highly-neutralized ionomer. In one embodiment, the geometric center of the thermoplastic inner core has a hardness of about 60 Shore C to 70 Shore C, the surface of the thermoplastic inner core has a hardness of about 68 Shore C to 78 Shore C, the surface of the outer core layer has a hardness of about 60 Shore C to 70 Shore C, the hardness at a point about 0.5 to 2 mm from the interface is about 66 Shore C to 76 Shore C, or a variety thereof. In another embodiment, the geometric center of the thermoplastic inner core has a hardness of about 60 Shore C to 70 Shore C, the surface of the thermoplastic inner core has a hardness of about 72 Shore C to 77 Shore C, the surface of the outer core layer has a hardness of about 70 Shore C to 80 Shore C, the hardness at a point about 0.5 to 2 mm from the interface is about 70 Shore C to 80 Shore C, or a variety thereof. Typically, the “positive hardness gradient” is about 2 to 7 Shore C, preferably about 3 to 5 Shore C. The shallow “negative hardness gradient” is generally about 2 to 8 Shore C, preferably about 3 to 6 Shore C.
The outer core layer includes a diene rubber and a metal salt of a carboxylic acid in an amount of about 25 phr to about 40 phr and has a ratio of antioxidant to initiator of about 0.40 or greater when normalized to 100% activity, preferably about 0.50 or greater. Alternatively, the initiator is present in the amount from about 0.25 phr to about 5.0 phr at 100% activity and the antioxidant is present in amount of about 0.2 phr to about 1 phr. The outer core layer may include an optional a soft and fast agent. FIG. 4 is a graph showing hardness values for a second embodiment of a dual core having a TP inner core with a “positive hardness gradient” and an outer core layer having a “negative hardness gradient”. The golf balls of the present invention may include a single-layer golf ball, and multi-layer golf balls, such as one having a core and a cover surrounding the core, but are preferably formed from a core comprised of a solid center (otherwise known as an inner core layer) and an outer core layer, and one or more cover layers. Any of the core and/or the cover layers may include more than one layer. In a preferred embodiment, the core is formed of a thermoplastic inner core layer and a rubber-based outer core layer where the inner core has a “positive hardness gradient” as measured radially inward from the outer surface of the inner core. A preferred outer core layer has a “negative hardness gradient” that is shallow in nature, typically having a gradient of less than about 10 Shore C/D points. The inventive cores may have a hardness gradient defined by hardness measurements made at the surface of the inner core (or outer core layer) and at points radially inward towards the center of the inner core, typically at 2-mm increments. As used herein, the terms “negative” and “positive” hardness gradients refer to the result of subtracting the hardness value at the innermost portion of the component being measured (e.g., the center of a solid core or an inner core in a dual core construction; the inner surface of a core layer; etc.) from the hardness value at the outer surface of the component being measured (e.g., the outer surface of a solid core; the outer surface of an inner core in a dual core; the outer surface of an outer core layer in a dual core, etc.). For example, if the outer surface of a solid core has a lower hardness value than the center (i.e., the surface is softer than the center), the hardness gradient will be deemed a “negative” gradient (a smaller number−a larger number=a negative number). It should be understood that hardness measurements taken at the ‘interface’ between the core layers are measured at a point about 0.5-2 mm (in either direction) from the actual physical interface on a half-sphere exposing the core cross-section. In a preferred embodiment, the golf balls of the present invention include an inner core layer formed from a thermoplastic (TP) material to define a “positive hardness gradient” and an outer core layer formed from a thermoset (TS) material to define a shallow (about 1 to 10 Shore C or Shore D) “negative hardness gradient.” The TP hardness gradient may be created by exposing the cores to a high-energy radiation treatment, such as electron beam or gamma radiation, such as disclosed in U.S. Pat. No. 5,891,973, which is incorporated by reference thereto, or lower energy radiation, such as UV or IR radiation; a solution treatment, such as in a isocyanate, silane, plasticizer, or amine solution, such as suitable amines disclosed in U.S. Pat. No. 4,732,944, which is incorporated by reference thereto; inclusion of additional free radical initiator groups in the TP prior to molding; chemical degradation; and/or chemical modification, to name a few. The magnitude (the difference between the harder outer surface and the of the “positive hardness gradient” of the TP layer is preferably greater than 1 Shore C/D, more preferably greater than 3 Shore C/D, and most preferably greater than 5 Shore C/D. In one specific embodiment, the magnitude of the “positive hardness gradient” is about 5 to 10 Shore C/D points. The magnitude (i.e., delta) of the shallow “negative hardness gradient” of the TS outer core layer is preferably greater than 1 Shore C but no greater than 10 Shore C, more preferably greater than 3 Shore C but no greater than 7 Shore C, and most preferably greater than 5 Shore C but no greater than 7 Shore C. In one specific embodiment, the magnitude of the “negative hardness gradient” is 5 to 10. Preferably, the thermoplastic layers (inner core or outer core layer), most preferably the inner core layer, are formed from a composition including at least one thermoplastic material. Preferably, the thermoplastic material comprises highly neutralized polymers; ethylene/acid copolymers and ionomers; ethylene/(meth)acrylate ester/acid copolymers and ionomers; ethylene/vinyl acetates; polyetheresters; polyetheramides; thermoplastic polyurethanes; metallocene catalyzed polyolefins; polyalkyl(meth)acrylates; polycarbonates; polyamides; polyamide-imides; polyacetals; polyethylenes (i.e., LDPE, HDPE, UHMWPE); high impact polystyrenes; acrylonitrile-butadiene-styrene copolymers; polyesters; polypropylenes; polyvinyl chlorides; polyetheretherketones; polyetherimides; polyethersulfones; polyimides; polymethylpentenes; polystyrenes; polysulfones; or mixtures thereof. In a more preferred embodiment, the thermoplastic material is a highly-neutralized polymer, preferably a fully-neutralized ionomer. Other suitable thermoplastic materials are disclosed in U.S. Pat. Nos. 6,213,895 and 7,147,578, which are incorporated herein by reference thereto. In a preferred embodiment, the inner core layer is formed from an HNP material or a blend of HNP materials. The acid moieties of the HNP's, typically ethylene-based ionomers, are preferably neutralized greater than about 70%, more preferably greater than about 90%, and most preferably at least about 100%. The HNP's can be also be blended with a second polymer component, which, if containing an acid group, may be neutralized in a conventional manner, by the organic fatty acids of the present invention, or both. The second polymer component, which may be partially or fully neutralized, preferably comprises ionomeric copolymers and terpolymers, ionomer precursors, thermoplastics, polyamides, polycarbonates, polyesters, polyurethanes, polyureas, thermoplastic elastomers, polybutadiene rubber, balata, metallocene-catalyzed polymers (grafted and non-grafted), single-site polymers, high-crystalline acid polymers, cationic ionomers, and the like. HNP polymers typically have a material hardness of between about 20 and about 80 Shore D, and a flexural modulus of between about 3,000 psi and about 200,000 psi. In one embodiment of the present invention the HNP's are ionomers and/or their acid precursors that are preferably neutralized, either fully or partially, with organic acid copolymers or the salts thereof. The acid copolymers are preferably α-olefin, such as ethylene, C3-8 α,β-ethylenically unsaturated carboxylic acid, such as acrylic and methacrylic acid, copolymers. They may optionally contain a softening monomer, such as alkyl acrylate and alkyl methacrylate, wherein the alkyl groups have from 1 to 8 carbon atoms. The acid copolymers can be described as E/X/Y copolymers where E is ethylene, X is an α,β-ethylenically unsaturated carboxylic acid, and Y is a softening comonomer. In a preferred embodiment, X is acrylic or methacrylic acid and Y is a C1-8 alkyl acrylate or methacrylate ester. X is preferably present in an amount from about 1 to about 35 weight percent of the polymer, more preferably from about 5 to about 30 weight percent of the polymer, and most preferably from about 10 to about 20 weight percent of the polymer. Y is preferably present in an amount from about 0 to about 50 weight percent of the polymer, more preferably from about 5 to about 25 weight percent of the polymer, and most preferably from about 10 to about 20 weight percent of the polymer. Specific acid-containing ethylene copolymers include, but are not limited to, ethylene/acrylic acid/n-butyl acrylate, ethylene/methacrylic acid/n-butyl acrylate, ethylene/methacrylic acid/iso-butyl acrylate, ethylene/acrylic acid/iso-butyl acrylate, ethylene/methacrylic acid/n-butyl methacrylate, ethylene/acrylic acid/methyl methacrylate, ethylene/acrylic acid/methyl acrylate, ethylene/methacrylic acid/methyl acrylate, ethylene/methacrylic acid/methyl methacrylate, and ethylene/acrylic acid/n-butyl methacrylate. Preferred acid-containing ethylene copolymers include, ethylene/methacrylic acid/n-butyl acrylate, ethylene/acrylic acid/n-butyl acrylate, ethylene/methacrylic acid/methyl acrylate, ethylene/acrylic acid/ethyl acrylate, ethylene/methacrylic acid/ethyl acrylate, and ethylene/acrylic acid/methyl acrylate copolymers. The most preferred acid-containing ethylene copolymers are, ethylene/(meth)acrylic acid/n-butyl, acrylate, ethylene/(meth)acrylic acid/ethyl acrylate, and ethylene/(meth)acrylic acid/methyl acrylate copolymers. Ionomers are typically neutralized with a metal cation, such as Li, Na, Mg, K, Ca, or Zn. It has been found that by adding sufficient organic acid or salt of organic acid, along with a suitable base, to the acid copolymer or ionomer, however, the ionomer can be neutralized, without losing processability, to a level much greater than for a metal cation. Preferably, the acid moieties are neutralized greater than about 80%, preferably from 90-100%, most preferably 100% without losing processability. This is accomplished by melt-blending an ethylene α,β-ethylenically unsaturated carboxylic acid copolymer, for example, with an organic acid or a salt of organic acid, and adding a sufficient amount of a cation source to increase the level of neutralization of all the acid moieties (including those in the acid copolymer and in the organic acid) to greater than 90%, (preferably greater than 100%). The organic acids of the present invention are aliphatic, mono- or multi-functional (saturated, unsaturated, or multi-unsaturated) organic acids. Salts of these organic acids may also be employed. The salts of organic acids of the present invention include the salts of barium, lithium, sodium, zinc, bismuth, chromium, cobalt, copper, potassium, strontium, titanium, tungsten, magnesium, cesium, iron, nickel, silver, aluminum, tin, or calcium, salts of fatty acids, particularly stearic, behenic, erucic, oleic, linoelic or dimerized derivatives thereof. It is preferred that the organic acids and salts of the present invention be relatively non-migratory (they do not bloom to the surface of the polymer under ambient temperatures) and non-volatile (they do not volatilize at temperatures required for melt-blending). The ionomers of the invention may also be more conventional ionomers, i.e., partially-neutralized with metal cations. The acid moiety in the acid copolymer is neutralized about 1 to about 90%, preferably at least about 20 to about 75%, and more preferably at least about 40 to about 70%, to form an ionomer, by a cation such as lithium, sodium, potassium, magnesium, calcium, barium, lead, tin, zinc, aluminum, or a mixture thereof. The cores (and, preferably the inner core layer) may also be formed from (or contain as part of a blend) thermoplastic non-ionomer resins. These polymers typically have a hardness in the range of 20 Shore D to 70 Shore D. Examples of thermoplastic non-ionomers include, but are not limited to, ethylene-ethyl acrylate, ethylene-methyl acrylate, ethylene-vinyl acetate, low density polyethylene, linear low density polyethylene, metallocene catalyzed polyolefins, polyamides including nylon copolymers and nylon-ionomer graft copolymers, non-ionomeric acid copolymers, and a variety of thermoplastic elastomers, including styrene-butadiene-styrene block copolymers, thermoplastic block polyamides, polyurethanes, polyureas, thermoplastic block polyesters, functionalized (e.g., maleic anhydride modified) EPR and EPDM, and syndiotactic butadiene resin. The thermoplastic and/or ionomeric compositions of the present invention can be blended with non-ionic thermoplastic resins, particularly to manipulate product properties. Examples of suitable non-ionic thermoplastic resins include, but are not limited to, polyurethane, poly-ether-ester, poly-amide-ether, polyether-urea, PEBAX® thermoplastic polyether block amides commercially available from Arkema Inc., styrene-butadiene-styrene block copolymers, styrene(ethylene-butylene)-styrene block copolymers, polyamides, polyesters, polyolefins (e.g., polyethylene, polypropylene, ethylene-propylene copolymers, ethylene-(meth)acrylate, ethylene-(meth)acrylic acid, functionalized polymers with maleic anhydride grafting, FUSABOND® functionalized olefins commercially available from E.I. du Pont de Nemours and Company, functionalized polymers with epoxidation, elastomers (e.g., EPDM, metallocene-catalyzed polyethylene) and ground powders of the thermoset elastomers. The inner cover layer material may include a flow modifier, such as, but not limited to, NUCREL® acid copolymer resins, and particularly NUCREL® 960. NUCREL® acid copolymer resins are commercially available from E.I. du Pont de Nemours and Company. The outer cover layer is preferably formed from a composition comprising polyurethane; polyurea; or a blend, copolymer, or hybrid of polyurethane/polyurea. The outer cover layer material may be thermoplastic or thermoset. Basically, polyurethane compositions contain urethane linkages formed by reacting an isocyanate group (N═C═O) with a hydroxyl group (OH). Polyurethanes are produced by the reaction of a multi-functional isocyanate with a polyol in the presence of a catalyst and other additives. The chain length of the polyurethane prepolymer is extended by reacting it with a hydroxyl-terminated curing agent. Polyurea compositions, which are distinct from the above-described polyurethanes, also can be formed. In general, polyurea compositions contain urea linkages formed by reacting an isocyanate group (N═C═O) with an amine group (NH or NH2). The chain length of the polyurea prepolymer is extended by reacting the prepolymer with an amine curing agent. Hybrid compositions containing urethane and urea linkages also may be produced. For example, a polyurethane/urea hybrid composition may be produced when a polyurethane prepolymer is reacted with an amine-terminated curing agent. The term, “hybrid polyurethane-polyureas” is also meant to encompass blends and copolymers of polyurethanes and polyureas. In addition to the materials disclosed above, any of the core or core layers may include one or more of the following materials (solely or in a blend with other suitable and/or preferred materials listed herein): thermoplastic elastomer, thermoset elastomer, synthetic rubber, thermoplastic vulcanizate, copolymeric ionomer, terpolymeric ionomer, polycarbonate, polyolefin, polyamide, copolymeric polyamide, polyesters, polyester-amides, polyether-amides, polyvinyl alcohols, acrylonitrile-butadiene-styrene copolymers, polyarylate, polyacrylate, polyphenylene ether, impact-modified polyphenylene ether, high impact polystyrene, diallyl phthalate polymer, metallocene-catalyzed polymers, styrene-acrylonitrile (SAN), olefin-modified SAN, acrylonitrile-styrene-acrylonitrile, styrene-maleic anhydride (S/MA) polymer, styrenic copolymer, functionalized styrenic copolymer, functionalized styrenic terpolymer, styrenic terpolymer, cellulose polymer, liquid crystal polymer (LCP), ethylene-propylene-diene rubber (EPDM), ethylene-vinyl acetate copolymer (EVA), ethylene propylene rubber (EPR), ethylene vinyl acetate, polyurea, and polysiloxane. Suitable polyamides for use as an additional material in compositions disclosed herein also include resins obtained by: (1) polycondensation of (a) a dicarboxylic acid, such as oxalic acid, adipic acid, sebacic acid, terephthalic acid, isophthalic acid or 1,4-cyclohexanedicarboxylic acid, with (b) a diamine, such as ethylenediamine, tetramethylenediamine, pentamethylenediamine, hexamethylenediamine, or decamethylenediamine, 1,4-cyclohexyldiamine or m-xylylenediamine; (2) a ring-opening polymerization of cyclic lactam, such as .epsilon.-caprolactam or .omega.-laurolactam; (3) polycondensation of an aminocarboxylic acid, such as 6-aminocaproic acid, 9-aminononanoic acid, 11-aminoundecanoic acid or 12-aminododecanoic acid; or (4) copolymerzation of a cyclic lactam with a dicarboxylic acid and a diamine. Specific examples of suitable polyamides include Nylon 6, Nylon 66, Nylon 610, Nylon 11, Nylon 12, copolymerized Nylon, Nylon MXD6, and Nylon 46. Other suitable core (or core layer) materials include VESTENAMER-type materials, which can be used in a thermoplastic nature. Cycloalkene rubbers include rubbery polymers formed from one or more cycloalkenes having from 5 to 20, preferably 5 to 15, ring carbon atoms. The cycloalkene rubbers (also referred to as polyalkenylene or polyalkenamer rubbers) may be prepared by ring opening metathesis polymerization of one or more cycloalkenes in the presence of organometallic catalysts as is known in the art. Such polymerization methods are disclosed, for example, in U.S. Pat. Nos. 3,492,245 and 3,804,803, the disclosures of which are hereby incorporated by reference. By the term, “cycloalkene rubber” as used herein, it is meant a compound having at least 20 weight % macrocycles (cyclic content). Suitable cyclic olefins that can be used to make the cycloalkene rubber include unsaturated hydrocarbons with 4 to 12 ring carbon atoms in one or more rings e.g., 1-3 rings, which exhibit in at least one ring an unsubstituted double bond which is not in conjugation to a second double bond which may be present and which may have any degree of substitution; the substituents must not interfere with the metathesis catalysts and are preferably alkyl groups of 1 to 4 carbon atoms or a part of a cyclic structure of 4 to 8 carbon atoms. Examples are cyclobutene, cyclopentene, cycloheptene, cis- and trans-cyclooctene, cyclononene, cyclodecene, cycloundecene, cis- and trans-cyclododecene, cis, cis-cyclooctadiene, 1-methyl-1,5-cyclooctadiene, 3-methyl-1,5-cyclooctadiene, and 3,7-dimethyl-1,5-cyclooctadiene. Examples of suitable polyalkenamer rubbers are polypentenamer rubber, polyheptenamer rubber, polyoctenamer rubber, polydecenamer rubber and polydodecenamer rubber. Polyoctenamer rubbers are commercially available from Evonik Degussa GmbH of Marl, Germany and sold under the VESTENAMER tradename. Examples of suitable commercially-available material include VESTENAMER 8012 (trans-bond content of about 80% and a melting point of about 54° C.) and VESTENAMER 6213 (trans-bond content of about 60% and a melting point of about 30° C.). Compositions comprising polyoctenamer rubber are also suitable for the cores and layers of the invention. The polyalkenamers may be blended with other polymeric materials. These materials include, but are not limited to, polybutadiene, polyisoprene, ethylene propylene rubber (“EPR”), ethylene propylene diene rubber (“EPDM”), styrene-butadiene rubber, styrenic block copolymer rubbers (such as SI, SIS, SB, SBS, SIBS, SEBS, and the like, where “S” is styrene, “I” is isobutylene, “B” is butadiene, and “E” is ethylene), butyl rubber, halobutyl rubber, polystyrene elastomers, polyethylene elastomers, polyurethane elastomers, polyurea elastomers, metallocene-catalyzed elastomers and plastomers, copolymers of isobutylene and para-alkylstyrene, halogenated copolymers of isobutylene and para-alkylstyrene, copolymers of butadiene with acrylonitrile, polychloroprene, alkyl acrylate rubber, chlorinated isoprene rubber, acrylonitrile chlorinated isoprene rubber, and combinations of two or more thereof. In order to obtain the desired hardness, it may be necessary to add one or more crosslinking monomers and/or reinforcing agents to the polymer composition. Nonlimiting examples of crosslinking monomers are zinc diacrylate, zinc dimethacrylate, ethylene dimethacrylate, trimethylol propane triacrylate. If crosslinking monomers are used, they typically are added in an amount of 3 to 40 parts (by weight based upon 100 parts by weight of polymer), and more preferably 5 to 30 parts. Other layers of the core, preferably the outer core layer, may be formed from a rubber-based composition treated to define a preferably shallow (1 to 10 Shore C/D) “negative hardness gradient,” and preferably the inner core layer is formed from the thermoplastic material of the invention and has a “positive hardness gradient.” For example, the inner core may be formed from the ‘hardness gradient’ thermoplastic material of the invention and the outer core layer may include the rubber composition. The outer core layer is preferably formed from base thermoset rubber, which can be blended with other rubbers and polymers, typically includes a natural or synthetic rubber. A preferred base rubber is 1,4-polybutadiene having a cis structure of at least 40%, preferably greater than 80%, and more preferably greater than 90%. Other suitable thermoset rubbers and preferred properties, such as Mooney viscosity, are disclosed in U.S. Pat. Nos. 7,351,165 and 7,458,905, both of which are incorporated herein by reference. Other thermoplastic elastomers may be used to modify the properties of the thermoplastic materials of the invention by blending with the base thermoplastic material. These TPEs include natural or synthetic balata, or high trans-polyisoprene, high trans-polybutadiene, or any styrenic block copolymer, such as styrene ethylene butadiene styrene, styrene-isoprene-styrene, etc., a metallocene or other single-site catalyzed polyolefin such as ethylene-octene, or ethylene-butene, or thermoplastic polyurethanes (TPU), including copolymers, e.g. with silicone. Other suitable TPEs include PEBAX®, which is believed to comprise polyether amide copolymers, HYTREL®, which is believed to comprise polyether ester copolymers, thermoplastic urethane, and KRATON®, which is believed to comprise styrenic block copolymers elastomers. Any of the TPEs or TPUs above may also contain functionality suitable for grafting, including maleic acid or maleic anhydride. Additional polymers may also optionally be incorporated into the inventive cores. Examples include, but are not limited to, thermoset elastomers such as core regrind, thermoplastic vulcanizate, copolymeric ionomer, terpolymeric ionomer, polycarbonate, polyamide, copolymeric polyamide, polyesters, polyvinyl alcohols, acrylonitrile-butadiene-styrene copolymers, polyarylate, polyacrylate, polyphenylene ether, impact-modified polyphenylene ether, high impact polystyrene, diallyl phthalate polymer, styrene-acrylonitrile polymer (SAN) (including olefin-modified SAN and acrylonitrile-styrene-acrylonitrile polymer), styrene-maleic anhydride copolymer, styrenic copolymer, functionalized styrenic copolymer, functionalized styrenic terpolymer, styrenic terpolymer, cellulose polymer, liquid crystal polymer, ethylene-vinyl acetate copolymers, polyurea, and polysiloxane or any metallocene-catalyzed polymers of these species. Suitable polyamides for use as an additional polymeric material in compositions within the scope of the present invention also include resins obtained by: (1) polycondensation of (a) a dicarboxylic acid, such as oxalic acid, adipic acid, sebacic acid, terephthalic acid, isophthalic acid, or 1,4-cyclohexanedicarboxylic acid, with (b) a diamine, such as ethylenediamine, tetramethylenediamine, pentamethylenediamine, hexamethylenediamine, or decamethylenediamine, 1,4-cyclohexanediamine, or m-xylylenediamine; (2) a ring-opening polymerization of cyclic lactam, such as ε-caprolactam or Ω-laurolactam; (3) polycondensation of an aminocarboxylic acid, such as 6-aminocaproic acid, 9-aminononanoic acid, 11-aminoundecanoic acid, or 12-aminododecanoic acid; or (4) copolymerization of a cyclic lactam with a dicarboxylic acid and a diamine. Specific examples of suitable polyamides include NYLON 6, NYLON 66, NYLON 610, NYLON 11, NYLON 12, copolymerized NYLON, NYLON MXD6 (m-xylylene diamine/adipic acid), and NYLON 46. Modifications in thermoplastic polymeric structure to create the “positive hardness gradient” can be induced by a number of methods, including exposing the TP material to high-energy radiation or through a chemical process using peroxide. Radiative sources include, but are not limited to, gamma rays, electrons, neutrons, protons, x-rays, helium nuclei, or the like. Gamma radiation, typically using radioactive cobalt atoms, is a preferred method for the inventive TP gradient cores because this type of radiation allows for considerable depth of treatment, if necessary. For cores requiring lower depth of penetration, such as when a small gradient is desired, electron-beam accelerators or UV and IR light sources can be used. Useful UV and IR irradiation methods are disclosed in U.S. Pat. Nos. 6,855,070 and 7,198,576, which are incorporated herein by reference thereto. The cores of the invention are typically irradiated at dosages greater than 0.05 Mrd, preferably ranging from 1 Mrd to 20 Mrd, more preferably from 2 Mrd to 15 Mrd, and most preferably from 4 Mrd to 10 Mrd. In one preferred embodiment, the cores are irradiated at a dosage from 5 Mrd to 8 Mrd and in another preferred embodiment, the cores are irradiated with a dosage from 0.05 Mrd to 3 Mrd, more preferably 0.05 Mrd to 1.5 Mrd. In these preferred embodiments, is also desirable to irradiate the cores for a longer time due to the low dosage and in an effort to create a larger TP hardness gradient. While a number of methods known in the art are suitable for irradiating the TP materials/cores, typically the cores are placed on and slowly move along a channel. Radiation from a radiation source, such as gamma rays, is allowed to contact the surface of the cores. The source is positioned to provide a generally uniform dose of radiation to the cores as they roll along the channel. The speed of the cores as they pass through the radiation source is easily controlled to ensure the cores receive sufficient dosage to create the desired hardness gradient. The cores are irradiated with a dosage of 1 or more Mrd, more preferably 2 Mrd to 15 Mrd. The intensity of the dosage is typically in the range of 1 MeV to 20 MeV. For thermoplastic resins having a reactive group (e.g., ionomer, thermoplastic urethane, etc. ), treating the thermoplastic core in a chemical solution of an isocyanate or and amine affects crosslinking and provide a harder surface and subsequent hardness gradient. Incorporation of peroxide or other free-radical initiator in the thermoplastic polymer, prior to molding or forming, also allows for heat curing on the molded core/core layer to create the desired gradient. By proper selection of time/temperature, an annealing process can be used to create a gradient. Suitable annealing and/or peroxide (free radical) methods are such as disclosed in U.S. Pat. Nos. 5,274,041 and 5,356,941, respectively, which are incorporated by reference thereto. Additionally, silane or amino-silane crosslinking may also be employed as disclosed in U.S. Pat. No. 7,279,529 and incorporated herein by reference. The inventive cores (or core layers) may be chemically treated in a solution, such as a solution containing one or more isocyanates, to form the desired hardness gradient. The cores are typically exposed to the solution containing the isocyanate by immersing them in a bath at a particular temperature for a given time. Exposure time should be greater than 1 minute, preferably from 1 minute to 120 minutes, more preferably 5 minutes to 90 minutes, and most preferably 10 minutes to 60 minutes. In one preferred embodiment, the cores are immersed in the treating solution from 15 minutes to 45 minutes, more preferably from 20 minutes to 40 minutes, and most preferably from 25 minutes to 30 minutes. Preferred isocyanates include aliphatic or aromatic isocyanates, such as HDI, IPDI, MDI, TDI, or diisocyanate or blends thereof known in the art. The isocyanate or diisocyanate used may have a solids content in the range of 1 wt % to 100 wt % solids, preferably 5 wt % to 50 wt % solids, most preferably 10 wt % to 30 wt % solids. In a most preferred embodiment, the cores of the invention are immersed in a solution of MDI (such as Mondur ML™, commercially available from Bayer) at 15 wt % to 30 wt % solids in ketone for 20 minutes to 30 minutes. Suitable solvents (i.e., those that will allow penetration of the isocyanate into the TP material) may be used. Preferred solvents include ketone and acetate. After immersion, the balls are typically air-dried and/or heated. Suitable isocyanates and treatment methods are disclosed in U.S. Pat. No. 7,118,496, which is incorporated herein by reference thereto. wherein R′ is a non-hydrolysable organofunctional group, X is a hydrolysable group, and n is 0-24. The non-hydrolysable organofunctional group typically can link (either by forming a covalent or by another binding mechanism, such as hydrogen bond) to a polymer, such as a polyolefin, thereby attaching the silane to the polymer. R′ is preferably a vinyl group. X is preferably alkoxy, acyloxy, halogen, amino, hydrogen, ketoximate group, amido group, aminooxy, mercapto, alkenyloxy group, and the like. Preferably, X is an alkoxy, RO—, wherein R is selected from the group consisting of a linear or branched C1-C8 alkyl group, a C6-C12 aromatic group, and R3C(O)—, wherein R3 is a linear or branched C1-C8 alkyl group. Typically, the silane can be linked to the polymer in one of two ways: by reaction of the silane to the finished polymer or copolymerizing the silane with the polymer precursors. 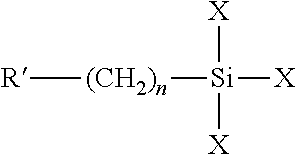 A preferred silane may also have the formula R′—(CH2)nSiXkQm or [R′—(CH2)n]2Si(X)pQq, wherein R′ is an unsaturated vinyl group; Q is selected from the group consisting of an isocyanate functionality, i.e., a monomer, a biuret, or an isocyanurate; a glycidyl, a halo group and —NR1R2, wherein R1 and R2 are each independently selected from the group consisting of H, a linear or branched C1-C8 alkyl group, a linear or branched C1-C8 alkenyl group and a linear or branched C1-C8 alkynyl group; X is a hydrolysable group; and n is 0-24, k is 1-3, m is 3-n, p is 1-2 and q is 2-p. X is preferably alkoxy, acyloxy, halogen, amino, hydrogen, ketoximate group, amido group, aminooxy, mercapto, alkenyloxy group, and the like. Preferably, the halo group is fluoro, chloro, bromo or iodo and is preferably chloro. wherein R1, R2, and R3 are each independently selected from the group consisting of a substituted or unsubstituted linear or branched C1-C8 alkyl group, a substituted or unsubstituted C6-C12 aromatic group and a halo group. Preferred halo groups include F, Cl or Br. The C1-C8 alkyl groups and the C6-C12 aromatic groups may be substituted with one or more C1-C6 alkyl groups, halo groups, such as F, Cl and Br, amines, CN, C1-C6 alkoxy groups, trihalomethane, such as CF3 or CCl3, or mixtures thereof. Preferably, R1, R2, and R3 are each independently selected from the group consisting of hydrogen, methyl, ethyl, n-propyl, isopropyl, n-butyl, isobutyl and tert-butyl. 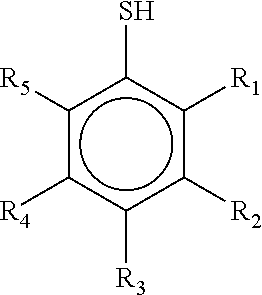 More preferably, R1, R2, and R3 are each independently hydrogen or methyl. Thus in a preferred embodiment, the silane is a vinyltrialkoxysilane, such as vinyltrimethoxysilane, vinyldimethoxysilane, vinyltrimethoxysilane, vinylmethoxysilane, vinyltriethoxysilane, vinyldiphenylchlorosilane, vinyltrichlorosilane, vinylsilane, (vinyl)(methyl)diethoxysilane, vinyltriacetoxysilane, vinyltris(2-methoxyethoxy)silane, vinyl triphenylsilane, and (vinyl)(dimethyl)chlorosilane. The silanes of the present invention are present from about 0.1 weight percent to about 100 weight percent of the polyolefin. Typically, the silanes are present from about 0.5 weight percent to about 50 weight percent of the polyolefin, preferably from about 1 weight percent to about 20 weight percent of the polyolefin, more preferably from about 2 weight percent to about 10 weight percent of polyolefin and even more preferably from about 3 weight percent to about 5 weight percent. As used herein, all upper and lower limits of the ranges disclosed herein can be interchanged to form new ranges. Thus, the present invention also encompasses silane amounts of from about 0.1 weight percent to about 5 weight percent of polyolefin, from about 1 weight percent to about 10 weight percent of polyolefin, and even from 20 weight percent to about 50 weight percent. Commercially-available silanes for moisture crosslinking may be used to form golf ball components and golf balls. A nonlimiting example of a suitable silane is SILCAT® RHS Silane, a multi-component crosslinking system for use in moisture crosslinking of stabilized polyethylene or ethylene copolymers (available at Crompton Corporation, Middlebury, Conn.). IN addition, functionalized resin systems also may be used, such as SYNCURE®, which is a silane-grafted, moisture-crosslinkable polyethylene system available from PolyOne Corporation of Cleveland, Ohio, POLIDAN®, which is a silane-crosslinkable HDPE available from Solvay of Padanaplast, Italy, and VISICO™/AMBICAT™, which is a polyethylene system that utilizes a non-tin catalyst in crosslinking available from Borealis of Denmark. Other suitable silanes include, but are not limited to, silane esters, such as octyltriethoxysilane, methyltriethoxylsilane, methyltrimethoxysilane, and proprietary nonionic silane dispersing agent; vinyl silanes, such as proprietary, vinyltriethoxysilane, vinyltrimethoxysilane, vinyl-tris-(2-methoxyethoxy)silane, vinylmethyldimethoxysilane; methacryloxy silanes, such as γ-methacryloxypropyltrimethoxysilane; epoxy silanes, such as β-(3,4-epoxycyclohexyl)ethyltrimethoxysilane, γ-glycidoxypropyltrimethoxysilane; sulfur silanes, such as gamma-mercaptopropyltrimethoxysilane proprietary polysulfidesilane, bis-(3-[triethoxisily]-propyl)-tetrasulfane; amino silanes, such as γ-aminopropyltriethoxysilane, γ-aminopropyltriethoxysilane, γ-aminopropyltriethoxysilane, aminoalkyl silicone solution, modified aminoorganosilane, gamma-aminopropyltrimethoxysilane, n-β-(aminoethyl)-γ-aminopropyltrimethoxysilane, modified aminoorganosilane (40% in methanol), modified aminosilane (50% in methanol), triaminofunctional silane, bis-(γ-trimethoxysilylpropyl)amine, n-phenyl-γ-aminopropyltrimethoxysilane, organomodified polydimethylsiloxane, polyazamide silane (50% in methanol), n-β-(aminoethyl)-γ-aminopropylmethyldimethoxysilane; ureido silanes, such as gamma-ureidopropyltrialkoxysilane (50% in methanol), γ-ureidopropyltrimethoxysilane; isocyanate silanes, such as γ-isocyanatopropyltriethoxysilane; and mixtures thereof. Preferably, the silane is an amino silane and more preferably, the amino silane is bis-(γ-trimethoxysilylpropyl)amine. Both irradiative and chemical methods promote molecular bonding, or cross-links, within the TP polymer. Radiative methods permit cross-linking and grafting in situ on finished products and cross-linking occurs at lower temperatures with radiation than with chemical processing. Chemical methods depend on the particular polymer, the presence of modifying agents, and variables in processing, such as the level of irradiation. Significant property benefits in the TP cores can be attained and include, but are not limited to, improved thermomechanical properties; lower permeability and improved chemical resistance; reduced stress cracking; and overall improvement in physical toughness. Additional embodiments involve the use of plasticizers to treat the molded core/layer thereby creating a softer outer portion of the core for a “negative” hardness gradient. The plasticizer may be reactive (such as higher alkyl acrylates) or non-reactive (i.e., phthalates, dioctylphthalate, or stearamides, etc). Other suitable plasticizers include, but are not limited to, oxa acids, fatty amines, fatty amides, fatty acid esters, phthalates, adipates, and sebacates. Oxa acids are preferred plasticizers, more preferably those having at least one or two acid functional groups and a variety of different chain lengths. Preferred oxa acids include 3,6-dioxaheptanoic acid, 3,6,9-trioxadecanoic acid, diglycolic acid, 3,6,9-trioxaundecanoic acid, polyglycol diacid, and 3,6-dioxaoctanedioic acid, such as those commercially available from Archimica of Wilmington, Del. Any means of chemical degradation will also give the desired “negative” hardness gradient. Chemical modifications such as esterification or saponification are also suitable for modification of the thermoplastic core/layer surface. Additionally, for TP resins having a reactive group, such as ionomers or thermoplastic urethanes, a treatment in a solution of one or more isocyanates or amines may affect crosslinking and promote a “positive hardness gradient.” U.S. Pat. Nos. 7,118,496 and 4,732,944 disclose suitable isocyanates and amines, respectively, and are incorporated herein by reference. Fillers may also be added to the thermoplastic materials of the core to adjust the density of the material up or down, without having any effect on the hardness gradient. Other ingredients that are known to those skilled in the art may be used, and are understood to include, but not be limited to, density-adjusting fillers, process aides, plasticizers, blowing or foaming agents, sulfur accelerators, and/or non-peroxide radical sources. The base thermoset rubber, which can be blended with other rubbers and polymers, typically includes a natural or synthetic rubber. A preferred base rubber is 1,4-polybutadiene having a cis structure of at least 40%, preferably greater than 80%, and more preferably greater than 90%. Examples of desirable polybutadiene rubbers include and TAKTENE® 1203G1, 220, 221, BUNA® CB22 and BUNA® CB23, commercially available from LANXESS Corporation; UBEPOL® 360L and UBEPOL® 150L and UBEPOL-BR rubbers, commercially available from UBE Industries, Ltd. of Tokyo, Japan; KINEX® 7245 and KINEX® 7265, commercially available from Goodyear of Akron, Ohio; SE BR-1220, commercially available from Dow Chemical Company; Europrene® NEOCIS® BR 40 and BR 60, commercially available from Polimeri Europa; and BR 01, BR 730, BR 735, BR 11, and BR 51, commercially available from Japan Synthetic Rubber Co., Ltd; COPERFLEX® BRNd-40 from Petroflex of Brazil; and KARBOCHEM® ND40, ND45, and ND60, commercially available from Karbochem. The base rubber may also comprise high or medium Mooney viscosity rubber, or blends thereof. The measurement of Mooney viscosity is defined according to ASTM D-1646. The Mooney viscosity range is preferably greater than about 40, more preferably in the range from about 40 to about 80 and more preferably in the range from about 40 to about 60. Polybutadiene rubber with higher Mooney viscosity may also be used, so long as the viscosity of the polybutadiene does not reach a level where the high viscosity polybutadiene clogs or otherwise adversely interferes with the manufacturing machinery. It is contemplated that polybutadiene with viscosity less than 65 Mooney can be used with the present invention. In one embodiment of the present invention, golf ball core layers made with mid- to high-Mooney viscosity polybutadiene material exhibit increased resiliency (and, therefore, distance) without increasing the hardness of the ball. Commercial sources of suitable mid- to high-Mooney viscosity polybutadiene include Bayer AG CB23 (Nd-catalyzed), which has a Mooney viscosity of around 50 and is a highly linear polybutadiene, and Dow 1220 (Co-catalyzed). If desired, the polybutadiene can also be mixed with other elastomers known in the art, such as other polybutadiene rubbers, natural rubber, styrene butadiene rubber, and/or isoprene rubber in order to further modify the properties of the core. When a mixture of elastomers is used, the amounts of other constituents in the core composition are typically based on 100 parts by weight of the total elastomer mixture. Suitable peroxide initiating agents include dicumyl peroxide; 2,5-dimethyl-2,5-di(t-butylperoxy)hexane; 2,5-dimethyl-2,5-di(t-butylperoxy)hexyne; 2,5-dimethyl-2,5-di(benzoylperoxy)hexane; 2,2′-bis(t-butylperoxy)-di-iso-propylbenzene; 1,1-bis(t-butylperoxy)-3,3,5-trimethyl cyclohexane; n-butyl 4,4-bis(t-butyl-peroxy)valerate; t-butyl perbenzoate; benzoyl peroxide; n-butyl 4,4′-bis(butylperoxy)valerate; di-t-butyl peroxide; or 2,5-di-(t-butylperoxy)-2,5-dimethyl hexane, lauryl peroxide, t-butyl hydroperoxide, α-αbis(t-butylperoxy)diisopropylbenzene, di(2-t-butyl-peroxyisopropyl)benzene, di-t-amyl peroxide, di-t-butyl peroxide. Preferably, the rubber composition includes from about 0.25 to about 5.0 parts by weight peroxide per 100 parts by weight rubber (phr), more preferably 0.5 phr to 3 phr, most preferably 0.5 phr to 1.5 phr. In a most preferred embodiment, the peroxide is present in an amount of about 0.8 phr. These ranges of peroxide are given assuming the peroxide is 100% active, without accounting for any carrier that might be present. Because many commercially available peroxides are sold along with a carrier compound, the actual amount of active peroxide present must be calculated. Commercially-available peroxide initiating agents include DICUP™ family of dicumyl peroxides (including DICUP™ R, DICUP™ 40C and DICUP™40KE) available from Crompton (Geo Specialty Chemicals). Similar initiating agents are available from AkroChem, Lanxess, Flexsys/Harwick and R.T. Vanderbilt. Another commercially-available and preferred initiating agent is TRIGONOX™ 265-50B from Akzo Nobel, which is a mixture of 1,1-di(t-butylperoxy)-3,3,5-trimethylcyclohexane and di(2-t-butylperoxyisopropyl)benzene. TRIGONOX™ peroxides are generally sold on a carrier compound. Suitable reactive co-agents include, but are not limited to, metal salts of diacrylates, dimethacrylates, and monomethacrylates suitable for use in this invention include those wherein the metal is zinc, magnesium, calcium, barium, tin, aluminum, lithium, sodium, potassium, iron, zirconium, and bismuth. Zinc diacrylate (ZDA) is preferred, but the present invention is not limited thereto. ZDA provides golf balls with a high initial velocity. The ZDA can be of various grades of purity. For the purposes of this invention, the lower the quantity of zinc stearate present in the ZDA the higher the ZDA purity. ZDA containing less than about 10% zinc stearate is preferable. More preferable is ZDA containing about 4-8% zinc stearate. Suitable, commercially available zinc diacrylates include those from Sartomer Co. The preferred concentrations of ZDA that can be used are about 10 phr to about 55 phr, preferably 10 phr to about 40 phr, alternatively about 15 phr to about 40 phr, more preferably 20 phr to about 35 phr, most preferably 25 phr to about 35 phr. In a particularly preferred embodiment, the reactive co-agent is present in an amount of about 21 phr to 31 phr, preferably about 29 phr to about 31 phr. Antioxidants are compounds that inhibit or prevent the oxidative breakdown of elastomers, and/or inhibit or prevent reactions that are promoted by oxygen radicals. Some exemplary antioxidants that may be used in the present invention include, but are not limited to, quinoline type antioxidants, amine type antioxidants, and phenolic type antioxidants. A preferred antioxidant is 2,2′-methylene-bis-(4-methyl-6-t-butylphenol) available as VANOX® MBPC from R.T. Vanderbilt. Other polyphenolic antioxidants include VANOX® T, VANOX® L, VANOX® SKT, VANOX® SWP, VANOX® 13 and VANOX® 1290. Suitable antioxidants include, but are not limited to, alkylene-bis-alkyl substituted cresols, such as 4,4′-methylene-bis(2,5-xylenol); 4,4′-ethylidene-bis-(6-ethyl-m-cresol); 4,4′-butylidene-bis-(6-t-butyl-m-cresol); 4,4′-decylidene-bis-(6-methyl-m-cresol); 4,4′-methylene-bis-(2-amyl-m-cresol); 4,4′-propylidene-bis-(5-hexyl-m-cresol); 3,3′-decylidene-bis-(5-ethyl-p-cresol); 2,2′-butylidene-bis-(3-n-hexyl-p-cresol); 4,4′-(2-butylidene)-bis-(6-t-butyl-m-cresol); 3,3′-4(decylidene)-bis-(5-ethyl-p-cresol); (2,5-dimethyl-4-hydroxyphenyl) (2-hydroxy-3,5-dimethylphenyl)methane; (2-methyl-4-hydroxy-5-ethylphenyl) (2-ethyl-3-hydroxy-5-methylphenyl)methane; (3-methyl-5-hydroxy-6-t-butylphenyl) (2-hydroxy-4-methyl-5-decylphenyl)-n-butyl methane; (2-hydroxy-4-ethyl-5-methylphenyl) (2-decyl-3-hydroxy-4-methylphenyl)butylamylmethane; (3-ethyl-4-methyl-5-hydroxyphenyl)-(2,3-dimethyl-3-hydroxy-phenyl)nonylmethane; (3-methyl-2-hydroxy-6-ethylphenyl)-(2-isopropyl-3-hydroxy-5-methyl-phenyl)cyclohexylmethane; (2-methyl-4-hydroxy-5-methylphenyl) (2-hydroxy-3-methyl-5-ethylphenyl)dicyclohexyl methane; and the like. Other suitable antioxidants include, but are not limited to, substituted phenols, such as 2-tert-butyl-4-methoxyphenol; 3-tert-butyl-4-methoxyphenol; 3-tert-octyl-4-methoxyphenol; 2-methyl-4-methoxyphenol; 2-stearyl-4-n-butoxyphenol; 3-t-butyl-4-stearyloxyphenol; 3-lauryl-4-ethoxyphenol; 2,5-di-t-butyl-4-methoxyphenol; 2-methyl-4-methoxyphenol; 2-(1-methycyclohexyl)-4-methoxyphenol; 2-t-butyl-4-dodecyloxyphenol; 2-(1-methylbenzyl)-4-methoxyphenol; 2-t-octyl-4-methoxyphenol; methyl gallate; n-propyl gallate; n-butyl gallate; lauryl gallate; myristyl gallate; stearyl gallate; 2,4,5-trihydroxyacetophenone; 2,4,5-trihydroxy-n-butyrophenone; 2,4,5-trihydroxystearophenone; 2,6-ditert-butyl-4-methylphenol; 2,6-ditert-octyl-4-methylphenol; 2,6-ditert-butyl-4-stearylphenol; 2-methyl-4-methyl-6-tert-butylphenol; 2,6-distearyl-4-methylphenol; 2,6-dilauryl-4-methylphenol; 2,6-di(n-octyl)-4-methylphenol; 2,6-di(n-hexadecyl)-4-methylphenol; 2,6-di(1-methylundecyl)-4-methylphenol; 2,6-di(1-methylheptadecyl)-4-methylphenol; 2,6-di(trimethylhexyl)-4-methylphenol; 2,6-di(1,1,3,3-tetramethyloctyl)-4-methylphenol; 2-n-dodecyl-6-tert butyl-4-methylphenol; 2-n-dodecyl-6-(1-methylundecyl)-4-methylphenol; 2-n-dodecyl-6-(1,1,3,3-tetramethyloctyl)-4-methylphenol; 2-n-dodecyl-6-n-octadecyl-4-methylphenol; 2-n-dodecyl-6-n-octyl-4-methylphenol; 2-methyl-6-n-octadecyl-4-methylphenol; 2-n-dodecyl-6-(1-methylheptadecyl)-4-methylphenol; 2,6-di(1-methylbenzyl)-4-methylphenol; 2,6-di(1-methylcyclohexyl)-4-methylphenol; methylcyclohexyl)-4-methylphenol; 2-(1-methylbenzyl)-4-methylphenol; and related substituted phenols. Suitable antioxidants further include, but are not limited to, alkylene trisphenols, such as 2,6-bis(2′-hydroxy-3′-t-butyl-5′-methyl benzyl)-4-methyl phenol; 2,6-bis(2′-hydroxy-3′-t-ethyl-5′-butyl benzyl)-4-methyl phenol; and 2,6-bis(2′-hydroxy-3′-t-butyl-5′-propyl benzyl)-4-methyl phenol. In an alternative embodiment, the antioxidant should be present in an amount to ensure that the hardness gradient of the inventive core layer is “negative” and shallow (1 to 10 Shore C/D). Preferably, about 0.2 phr to about 1 phr antioxidant is added to the core layer formulation, more preferably, about 0.3 to about 0.8 phr, and most preferably 0.4 to about 0.7 phr. Preferably, about 0.25 phr to about 1.5 phr of peroxide as calculated at 100% active can be added to the core layer formulation, more preferably about 0.5 phr to about 1.2 phr, and most preferably about 0.7 phr to about 1.0 phr. The ZDA amount can be varied to suit the desired compression, spin and feel of the resulting golf ball. The cure regime can have a temperature range between from about 290° F. to about 335° F., more preferably about 300° F. to about 325° F., and the stock is held at that temperature for at least about 10 minutes to about 30 minutes. Additional suitable examples of soft and fast agents (that are also believed to be cis-to-trans catalysts) include, but are not limited to, 4,4′-diphenyl disulfide; 4,4′-ditolyl disulfide; 2,2′-benzamido diphenyl disulfide; bis(2-aminophenyl)disulfide; bis(4-aminophenyl)disulfide; bis(3-aminophenyl)disulfide; 2,2′-bis(4-aminonaphthyl)disulfide; 2,2′-bis(3-aminonaphthyl)disulfide; 2,2′-bis(4-aminonaphthyl)disulfide; 2,2′-bis(5-aminonaphthyl)disulfide; 2,2′-bis(6-aminonaphthyl)disulfide; 2,2′-bis(7-aminonaphthyl)disulfide; 2,2′-bis(8-aminonaphthyl)disulfide; 1,1′-bis(2-aminonaphthyl)disulfide; 1,1′-bis(3-aminonaphthyl)disulfide; 1,1′-bis(3-aminonaphthyl)disulfide; 1,1′-bis(4-aminonaphthyl)disulfide; 1,1′-bis(5-aminonaphthyl)disulfide; 1,1′-bis(6-aminonaphthyl)disulfide; 1,1′-bis(7-aminonaphthyl)disulfide; 1,1′-bis(8-aminonaphthyl)disulfide; 1,2′-diamino-1,2′-dithiodinaphthalene; 2,3′-diamino-1,2′-dithiodinaphthalene; bis(4-chlorophenyl)disulfide; bis(2-chlorophenyl)disulfide; bis(3-chlorophenyl)disulfide; bis(4-bromophenyl)disulfide; bis(2-bromophenyl)disulfide; bis(3-bromophenyl)disulfide; bis(4-fluorophenyl)disulfide; bis(4-iodophenyl)disulfide; bis(2,5-dichlorophenyl)disulfide; bis(3,5-dichlorophenyl)disulfide; bis(2,4-dichlorophenyl)disulfide; bis(2,6-dichlorophenyl)disulfide; bis(2,5-dibromophenyl)disulfide; bis(3,5-dibromophenyl)disulfide; bis(2-chloro-5-bromophenyl)disulfide; bis(2,4,6-trichlorophenyl)disulfide; bis(2,3,4,5,6-pentachlorophenyl)disulfide; bis(4-cyanophenyl)disulfide; bis(2-cyanophenyl)disulfide; bis(4-nitrophenyl)disulfide; bis(2-nitrophenyl)disulfide; 2,2′-dithiobenzoic acid ethylester; 2,2′-dithiobenzoic acid methylester; 2,2′-dithiobenzoic acid; 4,4′-dithiobenzoic acid ethylester; bis(4-acetylphenyl)disulfide; bis(2-acetylphenyl)disulfide; bis(4-formylphenyl)disulfide; bis(4-carbamoylphenyl)disulfide; 1,1′-dinaphthyl disulfide; 2,2′-dinaphthyl disulfide; 1,2′-dinaphthyl disulfide; 2,2′-bis(1-chlorodinaphthyl)disulfide; 2,2′-bis(1-bromonaphthyl)disulfide; 1,1′-bis(2-chloronaphthyl)disulfide; 2,2′-bis(1-cyanonaphthyl)disulfide; 2,2′-bis(1-acetylnaphthyl)disulfide; and the like; or a mixture thereof. Preferred organosulfur components include 4,4′-diphenyl disulfide, 4,4′-ditolyl disulfide, or 2,2′-benzamido diphenyl disulfide, or a mixture thereof. A more preferred organosulfur component includes 4,4′-ditolyl disulfide. In another embodiment, metal-containing organosulfur components can be used according to the invention. Suitable metal-containing organosulfur components include, but are not limited to, cadmium, copper, lead, and tellurium analogs of diethyldithiocarbamate, diamyldithiocarbamate, and dimethyldithiocarbamate, or mixtures thereof. A substituted or unsubstituted aromatic organic compound is also suitable as a soft and fast agent. Suitable substituted or unsubstituted aromatic organic components include, but are not limited to, components having the formula (R1)x—R3-M-R4—(R2)y, wherein R1 and R2 are each hydrogen or a substituted or unsubstituted C1-20 linear, branched, or cyclic alkyl, alkoxy, or alkylthio group, or a single, multiple, or fused ring C6 to C24 aromatic group; x and y are each an integer from 0 to 5; R3 and R4 are each selected from a single, multiple, or fused ring C6 to C24 aromatic group; and M includes an azo group or a metal component. R3 and R4 are each preferably selected from a C6 to C10 aromatic group, more preferably selected from phenyl, benzyl, naphthyl, benzamido, and benzothiazyl. R1 and R2 are each preferably selected from a substituted or unsubstituted C1 to C10 linear, branched, or cyclic alkyl, alkoxy, or alkylthio group or a C6 to C10 aromatic group. When R1, R2, R3, or R4, are substituted, the substitution may include one or more of the following substituent groups: hydroxy and metal salts thereof; mercapto and metal salts thereof; halogen; amino, nitro, cyano, and amido; carboxyl including esters, acids, and metal salts thereof; silyl; acrylates and metal salts thereof; sulfonyl or sulfonamide; and phosphates and phosphites. When M is a metal component, it may be any suitable elemental metal available to those of ordinary skill in the art. Typically, the metal will be a transition metal, although preferably it is tellurium or selenium. In one embodiment, the aromatic organic compound is substantially free of metal, while in another embodiment the aromatic organic compound is completely free of metal. Other suitable soft and fast agents include, but are not limited to, hydroquinones, benzoquinones, quinhydrones, catechols, and resorcinols. Suitable compounds include, but are not limited to, those disclosed in U.S. patent application Ser. No. 11/829,461, the disclosure of which is incorporated herein in its entirety by reference thereto. The polybutadiene and/or any other base rubber or elastomer system may also be foamed, or filled with hollow microspheres or with expandable microspheres which expand at a set temperature during the curing process to any low specific gravity level. Other ingredients such as sulfur accelerators, e.g., tetra methylthiuram di, tri, or tetrasulfide, and/or metal-containing organosulfur components may also be used according to the invention. Suitable metal-containing organosulfur accelerators include, but are not limited to, cadmium, copper, lead, and tellurium analogs of diethyldithiocarbamate, diamyldithiocarbamate, and dimethyldithiocarbamate, or mixtures thereof. Other ingredients such as processing aids e.g., fatty acids and/or their metal salts, processing oils, dyes and pigments, as well as other additives known to one skilled in the art may also be used in the present invention in amounts sufficient to achieve the purpose for which they are typically used. Referring to FIG. 1, the center (mid-point) of the thermoplastic inner core layer should have a Shore C hardness of at least 84, preferably from 84 to 96 Shore C, more preferably from 90 to 96 Shore C. The outer surface of the inner core layer has a hardness that is less than the hardness of the center of the inner core layer (to define the “negative” hardness gradient), preferably at least 80 Shore C, more preferably from 80 to 92 Shore C, most preferably from 85 to 90 Shore C.
The inner surface of the thermoset rubber outer core layer has a Shore C hardness of 65 to 77 Shore C, preferably 67 to 73 Shore C, more preferably from 68 to 71 Shore C. The outer surface of the outer core layer has a hardness that is substantially less than the hardness of the inner surface of the outer core layer (to define the steep “negative” hardness gradient), at least 56 Shore C, preferably 56 to 65 Shore C, more preferably 57 to 64 Shore C, most preferably 58 to 63 Shore C. The gradient should be steep—at least −7, more preferably at least −10. The difference in hardness, Δh, between the outer surface of the inner core layer and the inner surface of the outer core layer, should be at least −3 Shore C, more preferably at least −5 Shore C, most preferably at least −7 Shore C (meaning that the inner surface of the outer core layer is softer than the outer surface of the inner core). The sloped lines in FIG. 1 depict the “direction” of the gradient and are by no means dispositive of the nature of the hardness values between the outer and inner surfaces—while one embodiment certainly is a linearly-sloped hardness gradient for both core layers having the values depicted in the Figure, it should be understood that the interim hardness values are not necessarily linearly related (i.e., they can be dispersed above and/or below the line). Referring to FIG. 2, the center (mid-point) of the thermoplastic inner core layer should have a Shore C hardness of at least about 84 Shore C, preferably about 84 Shore C to about 96 Shore C, more preferably about 90 Shore C to about 96 Shore C. The outer surface of the inner core layer has a hardness that is less than the hardness of the center of the inner core layer (to define the “negative” hardness gradient), preferably at least about 80 Shore C, more preferably about 80 Shore C to about 92 Shore C, most preferably about 85 Shore C to about 90 Shore C.
The inner surface of the thermoset rubber outer core layer has a Shore C hardness of about 65 Shore C to about 77 Shore C, preferably about 67 Shore C to about 73 Shore C, more preferably about 68 Shore C to about 71 Shore C. The outer surface of the outer core layer has a hardness that is less than the hardness of the inner surface of the outer core layer (to define the shallow “negative” hardness gradient), at least 64 Shore C, preferably about 64 Shore C to about 74 Shore C, more preferably about 66 Shore C to about 72 Shore C, most preferably about 68 Shore C to about 70 Shore C. The gradient should be shallow—between −1 to less than −7 (i.e., the difference in hardness (outer surface−inner surface) is negative and has a magnitude of 1-7), preferably −1 to −5, −1 to −3, or −3 to −5. The difference in hardness, Δh, between the outer surface of the inner core layer and the inner surface of the outer core layer, should be at least about −3 Shore C, more preferably at least about −5 Shore C, most preferably at least about −7 Shore C (meaning that the inner surface of the outer core layer is softer than the outer surface of the inner core). The sloped lines in FIG. 2 depict the “direction” of the gradient and are by no means dispositive of the nature of the hardness values between the outer and inner surfaces—while one embodiment certainly is a linearly-sloped hardness gradient for both core layers having the values depicted in the Figure, it should be understood that the interim hardness values are not necessarily linearly related (i.e., they can be dispersed above and/or below the line). Referring to FIG. 3, the core hardness values a golf ball having a dual core including a TP inner core layer having a “positive hardness gradient” and an outer core layer having a shallow “negative hardness gradient” are shown. The hardness measurements are taken at points across a cross-section of the core having a 1-inch diameter TP inner core and a 0.275-inch thick thermoset rubber outer core layer. The values are tabulated in TABLE 1. In this embodiment, preferably the geometric center point of the TP inner core has a hardness of about 55 to 75 Shore C, more preferably about 60 to 70 Shore C, and most preferably about 62 to 68 Shore C. The surface of the inner core preferably has a hardness of about 60 to 80 Shore C, more preferably about 68 to 78 Shore C, and most preferably about 71 to 76 Shore C. The outer core layer preferably has a hardness near its interface with the inner core (within about 0.5-2 mm) of about 58 to 78 Shore C, more preferably about 66 to 76 Shore C, and most preferably about 69 to 74 Shore C. The surface of the outer core layer preferably has a hardness of about 55 to 75 Shore C, more preferably about 60 to 70 Shore C, and most preferably about 62 to 68 Shore C.
Referring to FIG. 4, the core hardness values for a golf ball having a dual core including a TP inner core layer having a “positive hardness gradient” and an outer core layer having a shallow “negative hardness gradient” are shown. The hardness measurements are taken at points across a cross-section of the core having a 1.13-inch diameter TP inner core and a 0.225-inch thick thermoset rubber outer core layer. The values are tabulated in TABLE 1. In this embodiment, preferably the geometric center point of the TP inner core has a hardness of about 55 to 75 Shore C, more preferably about 60 to 70 Shore C, and most preferably about 62 to 68 Shore C. The surface of the inner core preferably has a hardness of about 61 to 81 Shore C, more preferably about 69 to 79 Shore C, and most preferably about 72 to 77 Shore C. The outer core layer preferably has a hardness near its interface with the inner core (within about 0.5-2 mm) of about 62 to 82 Shore C, more preferably about 70 to 80 Shore C, and most preferably about 73 to 78 Shore C. The surface of the outer core layer preferably has a hardness of about 65 to 85 Shore C, more preferably about 70 to 80 Shore C, and most preferably about 72 to 78 Shore C.
There are a number of alternative embodiments defined by the present invention. In one alternative embodiment, a “low spin” embodiment, the inner surface of the outer core layer is harder than the outer surface of the inner core. In a second alternative embodiment, a “high spin” embodiment, the inner surface of the outer core layer is softer than the outer surface of the inner core. The alternative to these embodiments, to form a “positive” hardness gradient, are also suitable. “Positive hardness gradient” embodiments, single solid core: the surface hardness of the core can range from 25 Shore D to 90 Shore D, preferably 45 Shore D to 70 Shore D. The surface hardness is most preferably 68 Shore D, 60 Shore D, or 49 Shore D. The corresponding hardness of the center of the solid core may range from 30 Shore D to 80 Shore D, more preferably 40 Shore D to 65 Shore D, and most preferably 61 Shore D, 52 Shore D, or 43 Shore D, respectively. The “positive” gradient is preferably 7, 8, or 6, respectively. Corresponding Atti compression values may be 135, 110, or 90, respectively. The COR of these cores may range from 0.800 to 0.850, preferably 0.803 to 0.848. “Positive hardness gradient” embodiments, dual core: the outer core surface hardness may range from 25 Shore D to 90 Shore D, more preferably 45 Shore D to 70 Shore D, and most preferably 68 Shore D, 61 Shore D, or 49 Shore D. The inner surface of the outer core may have a corresponding hardness of 61 Shore D, 61 Shore D, or 43 Shore D, respectively. The surface of the inner core can range from 40 Shore D to 65 Shore D, but is preferably and correspondingly 43 Shore D, 60 Shore D, or 49 Shore D, respectively. The center hardness of the inner core can range from 30 Shore D to 80 Shore D, more preferably 40 Shore D to 55 Shore D, and most preferably 43 Shore D, 50 Shore D, or 43 Shore D, respectively. The “positive” gradient is preferably 25, 11, or 6, respectively. The corresponding compressions are 100, 97, or 92 and COR values are 0.799, 0.832, or 0.801, respectively. “Negative hardness gradient” embodiments, single solid core: the surface hardness of the core can range from 20 Shore D to 80 Shore D, more preferably 35 Shore D to 60 Shore D. The surface hardness is most preferably 56 Shore D, 45 Shore D, or 40 Shore D. The corresponding center hardness may range from 30 Shore D to 75 Shore D, preferably 40 Shore D to 65 Shore D, and more preferably 61 Shore D, 52 Shore D, or 43 Shore D, respectively. The “negative” gradient is preferably −5, −7, or −3, respectively. Corresponding Atti compression values may be 111, 104, or 85, respectively. The COR of these cores may range from 0.790 to 0.820, preferably 0.795 to 0.812. “Negative hardness gradient” embodiments, dual core: the outer core surface hardness may range from 20 Shore D to 80 Shore D, preferably 35 Shore D to 55 Shore D, more preferably 45 Shore D, 40 Shore D, or 52 Shore D. The inner surface of the outer core may have a corresponding hardness of 52 Shore D, 43 Shore D, or 52 Shore D, respectively. The surface of the inner core can range from 30 Shore D to 75 Shore D, preferably 50 Shore D to 65 Shore D, more preferably and correspondingly 61 Shore D, 52 Shore D, or 56 Shore D, respectively. The center hardness of the inner core can range from 50 Shore D to 65 Shore D, but is preferably 61 Shore D, 52 Shore D, or 61 Shore D, respectively. The “negative” gradient is steep, preferably −16, −12, or −9, respectively. The corresponding compressions are 117, 92, or 115 and COR values are 0.799, 0.832, or 0.801, respectively. In a “low spin” embodiment, the hardness of the thermoplastic inner core (at any point—surface, center, or otherwise) ranges from 30 Shore C to 80 Shore C, more preferably 40 Shore C to 75 Shore C, most preferably 45 Shore C to 70 Shore C. Concurrently, the hardness of the outer core layer (at any point—surface, inner surface, or otherwise) ranges from 60 Shore C to 95 Shore C, more preferably 60 Shore C to 90 Shore C, most preferably 65 Shore C to 80 Shore C.
In a “high spin” embodiment, the hardness of the thermoplastic inner core ranges from 60 Shore C to 95 Shore C, more preferably 60 Shore C to 90 Shore C, most preferably 65 Shore C to 80 Shore C. Concurrently, the hardness of the outer core layer ranges from 30 Shore C to 80 Shore C, more preferably 40 Shore C to 75 Shore C, most preferably 45 Shore C to 70 Shore C.
In the embodiment where the interface (i.e., the area where the two components meet) of the outer core layer and the inner core has substantially the same hardness, the ranges provided for either the “low spin” or “high spin” embodiments are sufficient, as long as a “negative hardness gradient” is maintained and the hardness value at the inner surface of the outer core layer is roughly the same as the hardness value at the outer surface of the inner core. The lowest hardness anywhere in the core does not have to occur at the surface. In some embodiments, the lowest hardness value occurs within about the outer 6 mm of the core surface. However, the lowest hardness value within the core can occur at any point from the surface, up to, but not including the center, as long as the surface hardness is still different from the hardness of the center. The above embodiments may be tailored to meet predetermined performance properties. For example, alternative embodiments include those having an inner core having an outer diameter of about 0.250 inches to about 1.550 inches, preferably about 0.500 inches to about 1.500 inches, and more preferably about 0.750 inches to about 1.400 inches. In preferred embodiments, the inner core has an outer diameter of about 1.000 inch, 1.200 inches, or 1.300 inches, with a most preferred outer diameter being 1.130 inches. The outer core layer should have an outer diameter (the entire dual core) of about 1.30 inches to about 1.620 inches, preferably 1.400 inches to about 1.600 inches, and more preferably about 1.500 inches to about 1.590 inches. In preferred embodiments, the outer core layer has an outer diameter of about 1.510 inches, 1.530 inches, or most preferably 1.550 inches. For the preferred embodiments, the total core size is up to about 1.62 inches in diameter, preferably about 1.4 to 1.6 inches, more preferably about 1.5 to 1.58 inches, and most preferably about 1.53 to 1.57 inches. The inner core is relatively small, typically about 0.2 to 1.3 inches in diameter, preferably about 0.25 to 1.25 inches, more preferably about 0.5 to 1.1 inches, and most preferably about 0.75 to 1.0 inches. The outer core layer, typically has a thickness of about 0.05 to 0.71 inches, preferably about 0.1 to 0.29 inches, more preferably about 0.125 to 0.25 inches. In two preferred embodiments, the outer core layer is about 0.225 inches thick and about 0.275 inches thick. (3) Polyurethane-urea hybrids, blends or copolymers comprising urethane or urea segments. Suitable polyurethane compositions comprise a reaction product of at least one polyisocyanate and at least one curing agent. The curing agent can include, for example, one or more polyamines, one or more polyols, or a combination thereof. The polyisocyanate can be combined with one or more polyols to form a prepolymer, which is then combined with the at least one curing agent. Thus, the polyols described herein are suitable for use in one or both components of the polyurethane material, i.e., as part of a prepolymer and in the curing agent. Suitable polyurethanes and polyureas, saturated or unsaturated, and their components, such as prepolymers, isocyanates, polyols, polyamines, curatives, etc. are disclosed in U.S. patent application Ser. No. 11/772,903, which is incorporated herein by reference thereto. Alternatively, other suitable polymers for use in cover layers include partially- or fully-neutralized ionomers, metallocene or other single-site catalyzed polymers, polyesters, polyamides, non-ionomeric thermoplastic elastomers, copolyether-esters, copolyether-amides, polycarbonates, polybutadienes, polyisoprenes, polystryrene block copolymers (such as styrene-butadiene-styrene), styrene-ethylene-propylene-styrene, styrene-ethylene-butylene-styrene, and blends thereof. Thermosetting polyurethanes or polyureas are suitable for the outer cover layers of the golf balls of the present invention. In a preferred embodiment, the inventive core is enclosed with two cover layers, where the inner cover layer has a thickness of about 0.01 inches to about 0.06 inches, more preferably about 0.015 inches to about 0.040 inches, and most preferably about 0.02 inches to about 0.035 inches, and the inner cover layer is formed from a partially- or fully-neutralized ionomer having a Shore D hardness of greater than about 55, more preferably greater than about 60, and most preferably greater than about 65. The outer cover layer should have a thickness of about 0.015 inches to about 0.055 inches, more preferably about 0.02 inches to about 0.04 inches, and most preferably about 0.025 inches to about 0.035 inches, and has a hardness of about Shore D 60 or less, more preferably 55 or less, and most preferably about 52 or less. The inner cover layer is preferably harder than the outer cover layer. The outer cover layer may be formed of a partially- or fully-neutralized iononomer, a polyurethane, polyurea, or blend thereof. A most preferred outer cover layer is a castable or reaction injection molded polyurethane, polyurea or copolymer or hybrid thereof having a Shore D hardness of about 40 to about 50. A most preferred inner cover layer material is a partially-neutralized ionomer comprising a zinc, sodium or lithium neutralized ionomer such as SURLYN® 8940, 8945, 9910, 7930, 7940, or blend thereof having a Shore D hardness of about 63 to about 68. In another preferred embodiment, the core having a negative hardness gradient is enclosed with a single layer of cover material having a Shore D hardness of from about 20 to about 80, more preferably about 40 to about 75 and most preferably about 45 to about 70, and comprises a thermoplastic or thermosetting polyurethane, polyurea, polyamide, polyester, polyester elastomer, polyether-amide or polyester-amide, partially or fully neutralized ionomer, polyolefin such as polyethylene, polypropylene, polyethylene copolymers such as ethylene-butyl acrylate or ethylene-methyl acrylate, poly(ethylene methacrylic acid) co- and terpolymers, metallocene-catalyzed polyolefins and polar-group functionalized polyolefins and blends thereof. One suitable cover material is an ionomer (either conventional or HNP) having a hardness of about 50 to about 70 Shore D. Another preferred cover material is a thermoplastic or thermosetting polyurethane or polyurea. A preferred ionomer is a high acid ionomer comprising a copolymer of ethylene and methacrylic or acrylic acid and having an acid content of at least 16 to about 25 weight percent. In this case the reduced spin contributed by the relatively rigid high acid ionomer may be offset to some extent by the spin-increasing negative gradient core. The core may have a diameter of about 1.0 inch to about 1.64 inches, preferably about 1.30 inches to about 1.620, and more preferably about 1.40 inches to about 1.60 inches. Another preferred cover material comprises a castable or reaction injection moldable polyurethane, polyurea, or copolymer or hybrid of polyurethane/polyurea. Preferably, this cover is thermosetting but may be a thermoplastic, having a Shore D hardness of about 20 to about 70, more preferably about 30 to about 65 and most preferably about 35 to about 60. A moisture vapor barrier layer, such as disclosed in U.S. Pat. Nos. 6,632,147; 6,932,720; 7,004,854; and 7,182,702, all of which are incorporated by reference herein in their entirety, are optionally employed between the cover layer and the core. Other than in the operating examples, or unless otherwise expressly specified, all of the numerical ranges, amounts, values and percentages such as those for amounts of materials and others in the specification may be read as if prefaced by the word “about” even though the term “about” may not expressly appear with the value, amount or range. Accordingly, unless indicated to the contrary, the numerical parameters set forth in the specification and attached claims are approximations that may vary depending upon the desired properties sought to be obtained by the present invention. At the very least, and not as an attempt to limit the application of the doctrine of equivalents to the scope of the claims, each numerical parameter should at least be construed in light of the number of reported significant digits and by applying ordinary rounding techniques. Notwithstanding that the numerical ranges and parameters setting forth the broad scope of the invention are approximations, the numerical values set forth in the specific examples are reported as precisely as possible. Any numerical value, however, inherently contain certain errors necessarily resulting from the standard deviation found in their respective testing measurements. Furthermore, when numerical ranges of varying scope are set forth herein, it is contemplated that any combination of these values inclusive of the recited values may be used. While it is apparent that the illustrative embodiments of the invention disclosed herein fulfill the objective stated above, it is appreciated that numerous modifications and other embodiments may be devised by those skilled in the art. Therefore, it will be understood that the appended claims are intended to cover all such modifications and embodiments, which would come within the spirit and scope of the present invention. wherein the positive hardness gradient is up to about 10 Shore C and the shallow negative hardness gradient is less than about 10 Shore C.
2. The golf ball of claim 1, wherein the thermoplastic material comprises an ionomer, a highly-neutralized ionomer, a thermoplastic polyurethane, a thermoplastic polyurea, a styrene block copolymer, a polyester amide, polyester ether, a polyethylene acrylic acid copolymer or terpolymer, or a polyethylene methacrylic acid copolymer or terpolymer. 3. The golf ball of claim 2, wherein the thermoplastic material is a highly-neutralized ionomer. 4. The golf ball of claim 1, wherein the geometric center of the thermoplastic inner core has a hardness of about 60 Shore C to 70 Shore C.
5. The golf ball of claim 1, wherein the surface of the thermoplastic inner core has a hardness of about 68 Shore C to 78 Shore C.
6. The golf ball of claim 1, wherein the surface of the outer core layer has a hardness of about 60 Shore C to 70 Shore C.
7. The golf ball of claim 1, wherein the hardness at a point about 0.5 to 2 mm from the interface is about 66 Shore C to 76 Shore C.
8. The golf ball of claim 1, wherein the surface of the thermoplastic inner core has a hardness of about 72 Shore C to 77 Shore C.
9. The golf ball of claim 1, wherein the surface of the outer core layer has a hardness of about 70 Shore C to 80 Shore C.
10. The golf ball of claim 1, wherein the hardness at a point about 0.5 to 2 mm from the interface is about 70 Shore C to 80 Shore C.
11. The golf ball of claim 1, wherein the positive hardness gradient is about 2 to 7 Shore C.
12. The golf ball of claim 11, wherein the positive hardness gradient is about 3 to 5 Shore C.
13. The golf ball of claim 1, wherein the shallow negative hardness gradient is about 2 to 8 Shore C.
14. The golf ball of claim 13, wherein the shallow negative hardness gradient is about 3 to 6 Shore C.
15. The golf ball of claim 1, wherein the outer core layer comprises diene rubber and a metal salt of a carboxylic acid in an amount of about 25 phr to about 40 phr and has a ratio of antioxidant to initiator of about 0.40 or greater when normalized to 100% activity. 16. The golf ball of claim 15, wherein the ratio of antioxidant to initiator is about 0.50 or greater. 17. The golf ball of claim 15, wherein the initiator is present in the amount from about 0.25 phr to about 5.0 phr at 100% activity and the antioxidant is present in amount of about 0.2 phr to about 1 phr. 18. The golf ball of claim 1, wherein the outer core layer comprises a soft and fast agent.